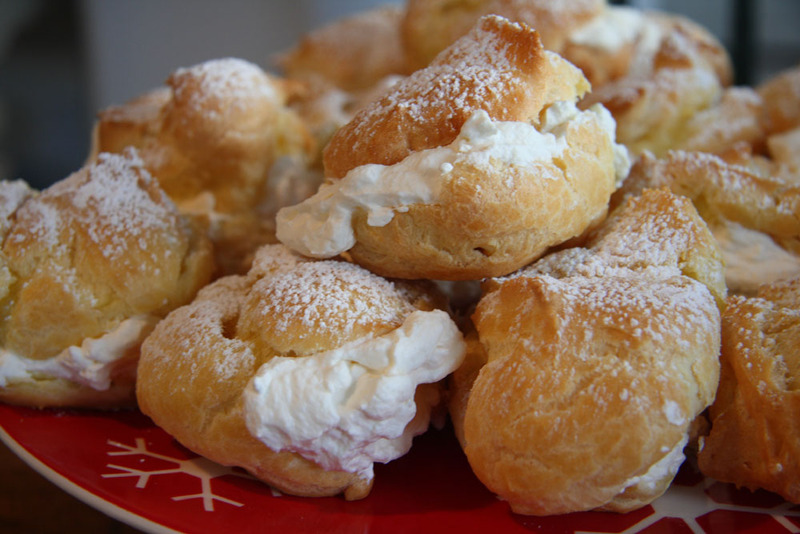 I spoke last week about how Valentine’s Day around here is equated with cream puffs. And it occurred to me that some of you might not know the story behind this family tradition. So, today, because it’s Valentine’s Day, I’m sharing a blog post I wrote back in 2007. It explains why I make cream puffs on Valentine’s Day. And I’ve updated it with better photos. In Dale’s family, Valentine’s Day is affectionately called “Cream Puff Day.” I still remember our first Valentine’s Day together, back in 1997. Dale and I used to meet at his house for lunch every day back then and he greeted me at the back door with a plate of cream puffs and the exclamation, “Happy Cream Puff Day, baby.” I asked him why we had cream puffs on Valentine’s Day and he said he didn’t know why but his mother always made them and it was a tradition. Me being a librarian, I had to know the whole story so I walked next door and asked Dale’s mother, Ruthie, to explain the cream puff tradition. She told me that it dated back to Valentine’s Day, 1948. She and Dale’s father, Jack, who was in the Air Force, were stationed in Roswell, New Mexico (yes, that Roswell – but that’s another story) and she was pregnant with her first baby. They had no money to buy Valentines for anyone and she really wanted to do something special for the guys in Jack’s unit. So she turned to her cookbooks and looked for something she could bake to give as gifts to these men. 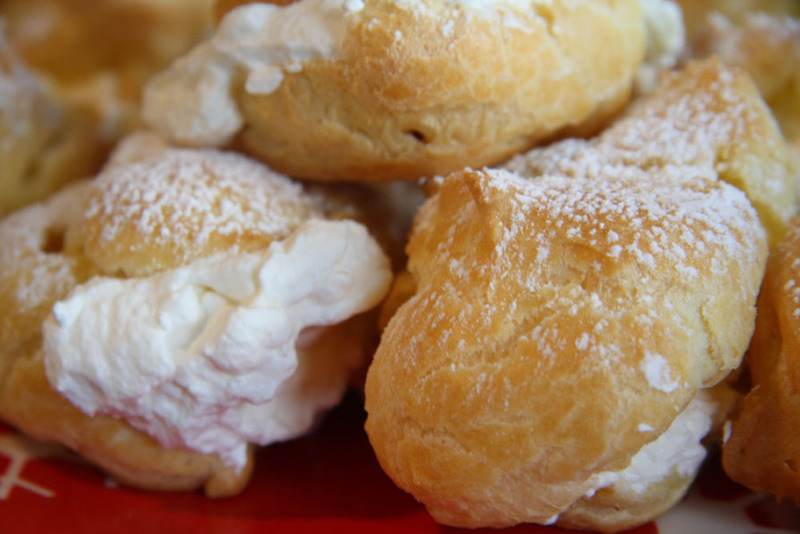 She found a recipe for cream puffs and realized that she had all the ingredients on hand and they sounded pretty simple to make. And a tradition was born. By the time I came along, Ruthie was making dozens of cream puffs every Valentine’s Day. She complained about how much work it was and how much time it took to make so many but I’m pretty sure she secretly loved the task. She made them for her and Jack plus their kids and grandkids. I was horrified when I realized that none of Dale’s kids even liked the cream puffs but Dale never told his mother because then she wouldn’t have given him as many. Then I tasted one and realized that sometimes a little deception is a wonderful thing. During the last few years of Ruthie’s life, she was unable to make the cream puffs anymore. Jack, wanting to carry on the tradition, purchased them from a bakery instead but they just weren’t as good as Ruthie’s. 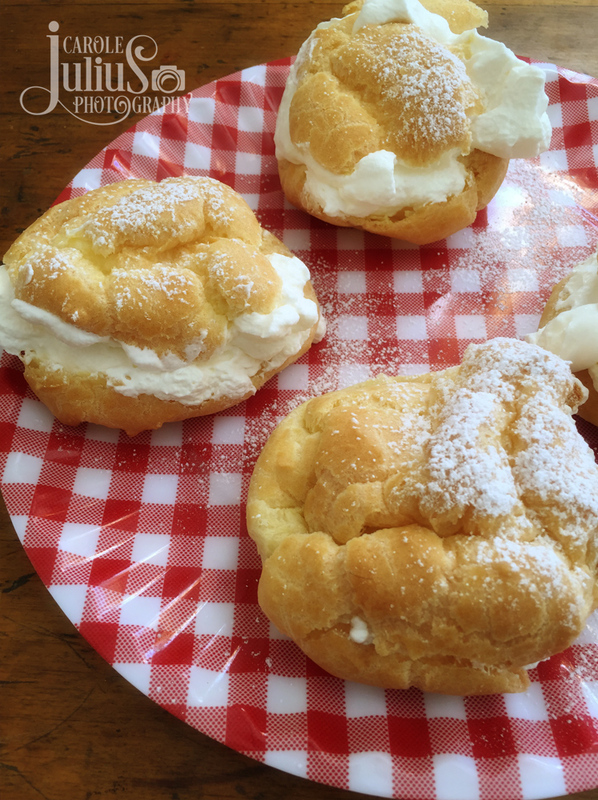 So last year, on the first Valentine’s Day without dear Ruth, I made the cream puffs. I was a little hesitant to do this. After all, I’m not Ruthie’s daughter, I’m just her daughter-in-law and it seemed like I was maybe overstepping my bounds by taking on a family tradition as deep as this one. But Dale encouraged me to go for it and Jack said it would be okay – so I did it. I’ll never forget the look on Jack’s face when he tried one and said they were as good as Ruthie’s. And Dale’s sister Lisa’s eyes filled with tears when she took a bite of hers, so I guess I did okay by Ruthie’s cream puffs. And now, somehow, this has become my tradition, too. There must be something about a cream puff! My mother -in- law would make them every Christmas Eve. Instead of powdered sugar we drizzled chocolate sauce over these heavenly confections. I’ve only tried to make them once. I’m afraid they didn’t match Nana’s. Traditions that you carry on because you or your family have always done them are lovely, and those that you choose to carry on through love are sweeter yet. Happy Cream Puff Day! What a sweet, sweet story. I have not had a cream puff in ages! Such a wonderful tradition. And man do they look good! What a wonderful family tradition — and a great story. I haven’t ever made cream puffs — but I love it when someone else does! Happy Valentine’s Day! That’s a sweet story and I love how you continue the tradition. Happy Valentine’s Day! ? This story brought tears to my eyes. Happy cream puff day to you and yours. I love family traditions. This one is extra special. It was created out of pure love and a desire to share and make others happy. Love it. Will you share your recipe? Happy Cream Puff Day (Valentine’s Day) to you. What a sweet tradition! I think carrying on a family tradition is just grand…they look mouth watering good! That’s such a lovely story! I make my mother-in-law’s cream puffs every Christmas. We had to make a change this past Christmas because of a strange schedule for a working (critical care nurse) daughter-in-law and a very strange visitation schedule with my grandson (the other, soon to be ex-daughter-in-law is just plain mean) so we didn’t have the cream puffs. While we all understood, it just wasn’t the same and all decided that it can’t happen again. Oh, how very lovely. Happy Valentine’s (Cream Puff) Day! It’s a wonderful tradition and you are the right person, the perfect person, to carry it on!! I’m not that sentimental, but this is such a great story, and such a wonderful tradition for you to take up the mantle/wooden spoon for. It’s hard to pass up a chance to make so many people happy. I used to make cream puffs, but I haven’t done it in a very long time. This story is wonderful. It’s so nice to have a back story for a tradition rather than a answer that says ” IDK, we just always have.” It’s even nicer that a tradition is based on love and generosity. Happy Cream Puff Day to you and Dale. What a sweet story, and it’s wonderful you are keeping the tradition going. As the daughter-in-law I’ve continued some of my husband’s family traditions, and it really makes you feel like one of the family. I looove cream puffs. They’re kinda fun to make too! aw, what a beautiful story and a sweet tradition. I know Ruthie would be delighted that Cream Puff Day continues and there isn’t anyone better suited to it than you! Happy Cream Puff Day!